Guess what! The Command Shiraz vineyard is celebrating its 125th birthday this year! This is an outstanding achievement for a vineyard. As you’ve heard us say many times, we are proud to be custodians of the Command Shiraz vineyard, planted in 1894. When Neil and Lorraine and their boys moved to the Elderton homestead in 1980, they worked tirelessly to rehabilitate the vineyard that had been sitting abandoned for around 10 years during the hard times the Barossa faced around the vine pull era. They saved this treasure. And we now enjoy an amazing wine from these amazing old vines. We are soon to release the 2015 Command Shiraz, available from 1 March 2019. You can also join us at Cellar Door on 2 March 2019 for the Command and Ashmead Masterclass, as we celebrate the wines’ release. Join Allister for a tasting of new release and back vintage Command Shiraz and Ashmead Cabernet Sauvignon. All attendees also receive a bottle of the 2015 Command to take home as a gift! More details and ticket information. Why are old vines better and how long can they live? Barossa has some the oldest vines in the world, as we are very lucky to be free of Phylloxera which has impacted many other vine-growing regions across the world. As stated by Barossa Grape & Wine Association, there are “…over 100 hectares of vines planted in the Barossa more than 100 years old that continue producing fruit to this day.” That is pretty special, and something the Barossa wine industry is proud to promote. At Elderton, the Command Shiraz block (pictured at the top of the page) was planted in 1894 (125 years ago). Langmeil Winery continues to produce wine from its Freedom Shiraz block, planted in 1843. This magnificent old vine (below) is part of our Command Shiraz block. Photographed by Dragan Radocaj, you can see the beauty of the gnarled arms that reflect the weathering of time and tell the stories of 125 years. These vines are not good because they are old, they are old because they are good. They have produced fruit of outstanding quality over their life, with bunches that are full of flavour, intensity and history. They deserve to remain in our vineyard. It must be said that a wine made from old vine fruit is not instantly better than a wine made from a younger vineyard – there are many factors that contribute. Old vines are picked and pruned by hand. They have lower yields than younger vines. These factors mean they are more labour, time and investment intensive. On the flip side, old vines are generally more effective at the ripening process and have in-built drought resistance as their roots are now so deep in the soil (up to 10+ metres in some cases here). There is also the sad story of the 1980s vine pull, through which a great number of old vine Shiraz and Grenache vineyards were lost. We are very lucky that the Barossa has some great custodians, who value the heritage as well as the fruit produced, and resolved to save our viticultural history. Barossa Grape & Wine Association classifies vineyards under the Old Vine Charter. Vines are considered to be old from 35 years of age. 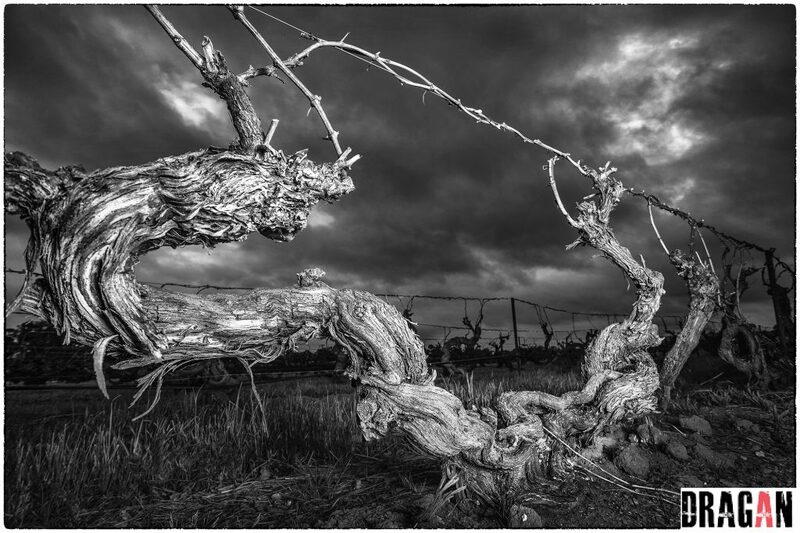 These exceptionally old vines serve as a witness to the Barossa’s resilience in the face of adversity. The Barossa, unlike many other of the world’s great wine regions, is phylloxera-free, which allowed these vines to mature into their thick, gnarly trunks and naturally-sculptured forms without interference. Noted for their low yields and intensity of flavour. Planted generations ago – when dry-farming techniques demanded careful site selection – Centenarian Vines have truly withstood the test of time. The Ashmead family remain proud custodians of the Command Shiraz and Ashmead Cabernet Sauvignon vines, along with the 1915 Shiraz and a number of 40+ year old blocks of Shiraz, Cabernet Sauvgnon, Grenache, and Carignan. The team at Elderton take great pride in maintaining our old vines, allowing them to produce outstanding fruit that contributes to our award-winning wines. If you would like any further information, please contact Jess.